“Each of us has our own ‘truth,’ gained from our own experience and beliefs, and from the people around us. However, our views might not always be an accurate reflection of reality, so we sometimes need to re-assess them so that we can avoid self-deception. 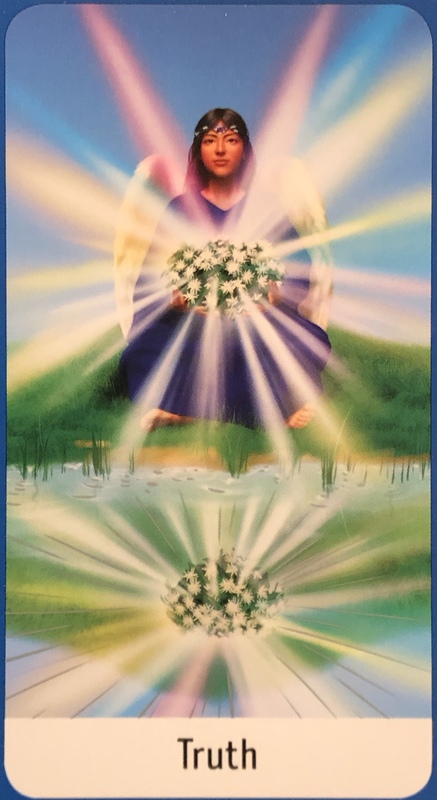 Interesting synchronicity in this card; that Truth is symbolized by reflection and light. As above so below; the inside is reflected into the outside world. Are you living your Truth? If not, what would need to change in order to do so? What would you have to release? What would you have to communicate? How would you need to shift things? When you look in the mirror, is your authenticity mirrored back to you? Or is there a mask that stands in your way? We use our life experience to form beliefs and barriers around who we are in the world. We create a story, and we stick to it! Some of the story is truth, and some of it is fiction, picked up along the way. It is time to remove the fiction and overhaul our story; recreate our place in the world. Starting with the Truth about how we see ourselves and what we are capable of. Be very aware of the signs, symbols and messages coming to you at this time from the Angel of Truth. Often we may choose not to see or acknowledge the Truth, but once we put the wheels in motion, the signs simply cannot be denied. Use all of your senses and your intuition to find the Truth in others, and trust that the signs you receive are for you; there are no coincidences.